With the harnessing of steam, paper matured into the product we know and love today. The chief difference between modern paper and its predecessor, manufactured until the nineteenth century, was that wood replaced cotton as the chief ingredient of paper. In the production process itself, the crucial changes have been the use of fossil fuels to replace most human labor—and the enormous mechanical ingenuity that came in consequence. Cotton fiber has not, of course, entirely disappeared. The highest quality papers still contain it. And new ingredients have been added to the fibers. Papers are coated chemically. And the slick sheets we associate with magazines and high-quality advertising flyers contain large amounts of clay—the fibers serving to give the sheet extra strength. Much as reinforced concrete is strengthened by hidden steel rods, so slick paper might now be called reinforced clay. The making of writing surfaces has always been a complex process—whether the raw material was papyrus, skins, cotton, or wood fibers. We’ve come across a splendid graphical presentation of this complexity in modern paper production thanks to the West Linn Paper Company of Portland, Oregon. We invite you to click through this link and then spend some time absorbing the complexity that paper-making has become. The image will enlarge if you click on it—enabling your to read the text. In this case—as in all things modern—the overview is little more than that. Each of these images, if unpacked, would reveal incredible complexity in detail. Better yet, why not take a YouTube tour of West Linn’s paper production by clicking on this link… Some of the complexity of making paper will become immediately apparent. Here we have another benefit of modern life. We can actually show you the process—whereas the ancient arts survive only as…well, words on paper. To make sure that this post will sufficiently honor West Linn, we also use a photograph of the company’s mill as our sole illustration; it is the photo used on the company’s web site here. 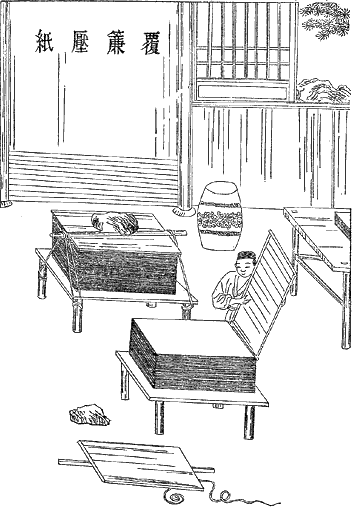 Paper—pulped fiber—is thought to have been first produced in China by Ts’ai Lun. He was a councilor at the court of Emperor Ho Ti around 110 AD. Lun produce paper by beating moistened hemp and cotton rags into a liquid slurry. He spread this pulp thinly over a screen and let it dry. Thus he produced even flat sheets very suitable to receive writing. The Italians were the first producers of paper in Europe, and it is temping to imagine that Marco Polo (1254-1324) introduced the technology from China. But no. It reached the Islamic world first and, before the Europeans picked it up, paper mills already operated in Baghdad. The transmission point appears to have been today’s Kyrgyzstan where the Islamic and Chinese cultures collided, specifically the Abbasid Caliphate and the Tang Dynasty in the battle of Talas, in 751. By the time Marco Polo returned from meetings with the Kublai Khan in 1269, Italy had already become Europe’s leading producer of paper made of cotton pulp, a position the region retained for a century. The region? Yes. Italy did not become a country until the days of Garibaldi in the nineteenth century. The French became producers in 1350. But it was the Germans who gave paper the big leg up when, around 1450, Johann Gutenberg introduced movable type to the world—and, in a manner of speaking, cotton first became king. Demand for paper then soared. Modern, mechanical paper production using wood fibers emerged yesterday, as it were, in the nineteenth century. But by then the dawn of paper had become the daylight of modern life, and of that stage, later. Picture credit: Wikipedia commons, here. Writing on skin predates the writing on paper derived from papyrus by at least two centuries—but only provided that we accept Pliny’s claim that paper production began with the founding of Alexandria by Alexander the Great (356-323 BC). But, to the contrary, we have papyrus documents going back to the First Dynasty in Egypt, which ended in 2890 BC. History, you might say, is created by those who write it, hence Alexander gets the nod—much as Al Gore embraced the Internet. Papyrus was thus used as a writing surface in Egypt long, long before Alexander was born—but right alongside animal skins. Documents on skin exist from the Fourth Dynasty of Egypt (ended 2467 BC). Herodotus (484-425 BC) mentions that Greeks used the word skins (diphtheria) for books. But the later name for this kind of writing surface, parchment or pergamum, arose quite late in the history of writing. We have Pliny’s word for that. During the reign of Eumenes II of Pergamum (197-158 BC), papyrus suddenly became unavailable. The product came almost exclusively from Alexandria in Egypt. One of the Ptolemy’s ruling Egypt then stopped exports to reserve papers for his famed Library of Alexandria. This challenge caused Eumenes, a member of the Attalid Dynasty, to launch an effort, on behalf of his library in Pergamum, to replace one “medium” with another and much more expensive one—animal skins. But what is expense, you might ask, when it comes to furnishing your library. All readers will understand. Where is Pergamum? It is on the western edge of today’s Turkey and now called Bergama, thus on the side that fronts on the Aegean Sea. A look at any atlas will show the relationships involved. Eumenes used to get his papyrus by ship from Alexandria almost directly to the south on the northern coast of Egypt—and the ships were coming in empty. Thus was born the most expensive and finest writing medium ever produced by humanity, parchment. Our word vellum, used today for very high quality paper with a textured surface, comes from the highest grade of parchment prepared in ancient times from the skins of young calves. The word derives from the Latin vitulus for calf. Yes. Books were once a real luxury product. As one source tells us (here): “The base material of those magnificent illuminated medieval manuscripts we cherish came at great cost: one particularly splendid gospel required 1,500 calfskins to make the vellum.” Food for the body, food for thought. When the ancients reverently turned the pages of their books, they were handling something that, once, had actually lived. — But, come to think of it, as we now swiftly page through a paperback, the same thing is true. The life we touch, however, came from lower down on evolution’s ladder. “The Wizard and the Hopping Pot” is the first of the the five children’s fables in J.K. Rowling’s The Tales of Beedle the Bard, a short collection of children’s fables from the world she created for her Harry Potter series. In this tale, a callous young wizard is taught a lesson in human … er, muggle kindness by his dearly departed Dad’s potions pot. The tale itself is a sharp quick read. Although Rowling has wrapped up the Potter series, she still shows herself to have a razor-sharp grasp of the world she created. Better yet, like all the fables in this collection, “The Wizard and the Hopping Pot” is appended with notes by Professor Albus Dumbledore and well footnoted by both Hermione Granger and J.K. Rowling, all of which are of as much interest to the Potter-phile as the tale itself. Here we have a book of fables based on a fictional title by a fictional author, with notes and interpretations by a fictional wizard, and with additional footnotes by a fictional witch and the actual author. It’s a hopping fine mix. Papyrus, the plant, is alive and well and grown all over the world. Any search for images on Google will produce a huge number of photographs. We begin today by showing an old drawing that shows the plant from root to seed-bearing crown (but the seeds are very tiny). This is a tall plant, ranging from 5 to 16 feet in height. The inner portion of the tall stem, called the pith, was used in strips to form actual sheets of paper in an overlaid pattern. The ancient scrolls were in itially sheets joined end to end, up to twenty glued together and then rolled up. Vertical strips were first laid down and joined (slightly over-lapped). 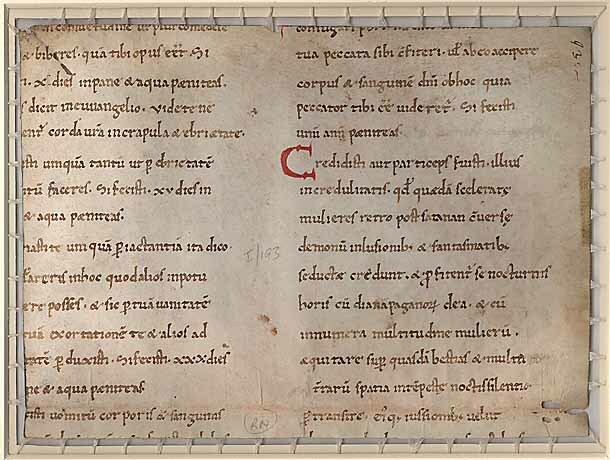 The horizontal sheet was built on top of these and were then used as the preferred writing surface, the orientation of the strips providing a kind of ruling for the writing hand. This approach is rendered in a drawing here and in The Heracles Papyrus reproduced below. You can see that the writing follows the horizontal lines. To be sure, in efforts to conserve on this valuable commodity, the ancients also wrote on the back of these “pages” when they had to, but it was a lot more difficult to do. 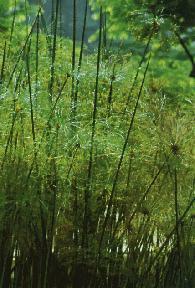 The photograph (below) shows living papyrus. 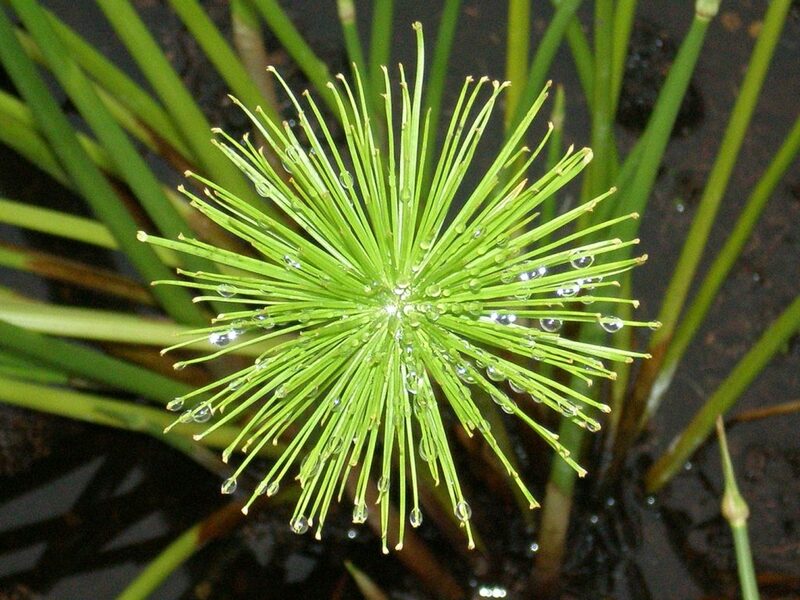 The plan is called Cyperus papyrus and is a variety of sedge. Cotton grass, for instance, is a sedge. In looking at images of papyrus growing, we discovered that there is a variety known as Dwarf Papyrus. We were inclined and therefore immediately fell in love with it. What a genius Dwarf Papyrus is—even in the choice of its excellent name. We end this closer look at papyrus, a product of nature that has lent its pith for human enlightenment, with a picture of the dwarf. Picture credits: (1) The Drawing of the Plants: History of Egypt by S. Rappaport. This is a very old book, but we cannot locate its date. You may view it here. (2) The drawing of the weave: your artistically talented Editors; (3) The Heracles Papyrus: Wikipedia; (4) the photograph of Cyperus papyrus: Earlham College (Richmond, IN) website here; and (5) Dwarf Papyrus: Gardensoyvey.com, here. Paper is made from the papyrus, by splitting it with a needle into very thin leaves, due care being taken that they should be as broad as possible. That of the first quality is taken from the centre of the plant, and so in regular succession, according to the order of division. “Hieratica” [holy] was the name that was anciently given to it, from the circumstance that it was entirely reserved for the religious books. In later times, through a spirit of adulation, it received the name of “Augusta,” just as that of second quality was called “Liviana,” from his [Octvian’s] wife, Livia; the consequence of which was, that the name “hieratica” came to designate that of only third-rate quality. The paper of the next quality was called “amphitheatrica,” from the locality [near that place in Alexandria] of its manufacture. The skilful manufactory that was established by Fannius at Rome, was in the habit of receiving this last kind, and there, by a very careful process of insertion, it was rendered much finer; so much so, that from being a common sort, he made it a paper of first-rate quality, and gave his own name [Fannia] to it: while that which was not subjected to this additional process retained its original name of “amphitheatrica.” Next to this is the Saitic paper, so called from the city of that name, where it is manufactured in very large quantities, though of cuttings of inferior quality. The Tæniotic paper, so called from a place in the vicinity, is manufactured from the materials that lie nearer to the outside skin; it is sold, not according to its quality, but by weight only. As to the paper that is known as “emporetica” [shop paper], it is quite useless for writing upon, and is only employed for wrapping up other paper, and as a covering for various articles of merchandize, whence its name, as being used by dealers. After this comes the bark of the papyrus, the outer skin of which bears a strong resemblance to the bulrush, and is solely used for making ropes, and then only for those which have to go into the water. The translation of this text is referenced in the last post. Here, as there, we’ve omitted the footnotes, but these may be read at the source, the Tufts University Perseus Digital Library, here. For people whose impressions of Roman times are formed by the movies, this sort of document from the first century should be eye-opening. Technological progress is alive and well, brand names appear—and paper is already available in various forms, not least as wrapping paper in your local store. The labor- intensive process whereby hand-cut strips of the pith inside stalks of the papyrus plant were carefully laid now in horizontal and now in vertical rows—thus to create mutually supporting structures overlaid—reminds us of the vast changes that have taken place since. Pliny the Elder (23-79 A.D.) was a naturalist and natural philosopher; he also served as a military and naval commander in the time of Vespasian. This brief summation of paper in its earliest form, as papyrus, is wonderfully modern in sound—and yet, we suggest, echoes the sentiments of all those who are engaged in reading and writing.